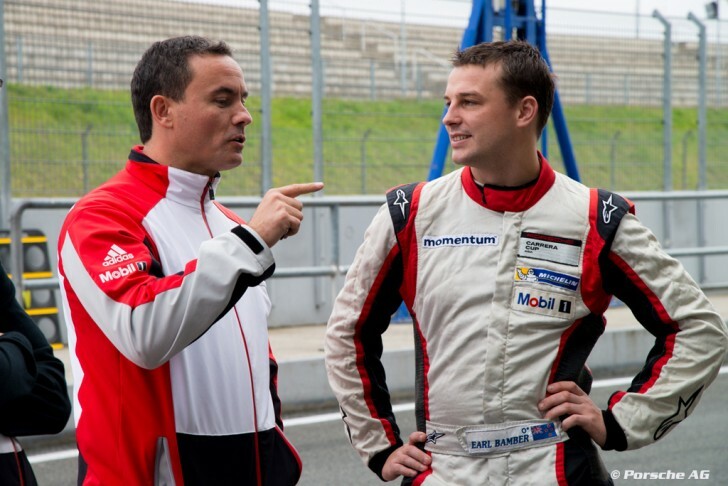 New Zealander Earl Bamber (23) is the winner of the Porsche Motorsport International Cup Scholarship challenge. He receives funding of 200,000 Euro for his 2014 Porsche Mobil 1 Supercup campaign. Porsche Carrera Cup Asia nominated Bamber for the shootout in Oschersleben (Germany), where he managed to beat seven other top pilots from Porsche one make cups series around the world. Over two days, the successful one make cup pilots had to set not only the fastest possible lap times on the 3.7 kilometre Motorsportarena Oschersleben race track, but also demonstrate their technical understanding and analytical skills in setting up the 460 hp Porsche 911 GT3 Cup (991). Part of the selection process included the simulation of a qualifying session as well as an entire race. Earl Bamber began carving out his racing career at the wheel of a kart. At the young age of eight he won his first national title in New Zealand. As a 15 year old he switched to the New Zealand Formula Ford Championship before heading off to Asia two years later. Success quickly followed: He promptly won the Asian Formula BMW title. The young Kiwi turned heads at his other career stages as well, achieving pole positions, fastest race laps and podium results in the Formula Renault V6 and Australian Formula 3, despite a tight budget. In 2008 he notched up two vice-championship trophies – in the Formula Renault V6 Asia and the Toyota Racing Series New Zealand. In 2009 Bamber contested several rounds of the international A1 GP Formula Series for the New Zealand team, and finished on the podium three times. He also climbed the podium in the GP2 Asia – at the age of just 19 years. In 2010 he repeated his 2008 success and was again crowned runner-up in the New Zealand Toyota Racing Series. He made his debut in the Porsche Carrera Cup Asia in 2013 and convincingly won the championship after scoring a total of seven victories. This year marks the second time that the International Porsche Motorsport Cup Scholarship is awarded. Already at a club sport level, talented youngsters have the chance to impress and advance into the GT3 Cup Challenges or the Porsche Carrera Cups contested around the globe, where they learn everything they need for a career as a racing professional. By way of the next stage – Porsche’s flagship series, the Porsche Mobil 1 Supercup – a number of pilots have succeeded in switching to international GT and prototype racing series. Several of them represent Porsche worldwide as works drivers in major race series.